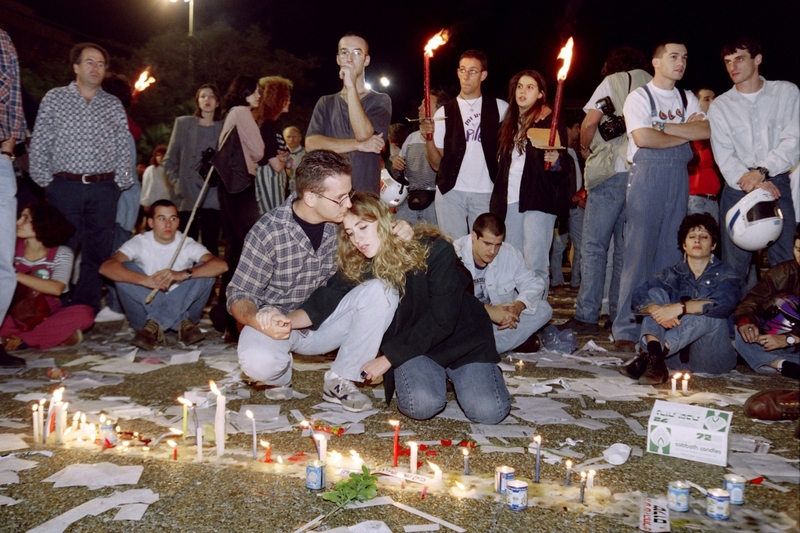 Israelis gathered to mourn the death of Rabin after the Israeli prime minister was assassinated following a peace rally in Tel Aviv on Nov. 4, 1995. Each year since the death of Israeli Prime Minister Yitzhak Rabin, Israel has marked his assassination with a public gathering in the Tel Aviv square where he was killed in 1995. In the crowd this year, Ora Zvern-Anafi, 63, wiped tears away. Rabin's murder "still, still, still it kills me," she said. "Then, there was hope things would get better. But instead, things just got worse." The murder shocked Israel — and the world — particularly because the man who killed the Israeli leader was an Israeli Jew. Rabin had signed an agreement with the Palestinians two years earlier that set the two sides on a controversial path toward peace. The plan deeply divided Israel, and that divide lingers today. Nearby at the Tel Aviv gathering, Avi Shai stayed dry-eyed. He said he never agreed with Rabin's policy, but he walked the two blocks from his apartment to the rally instead of watching on TV. 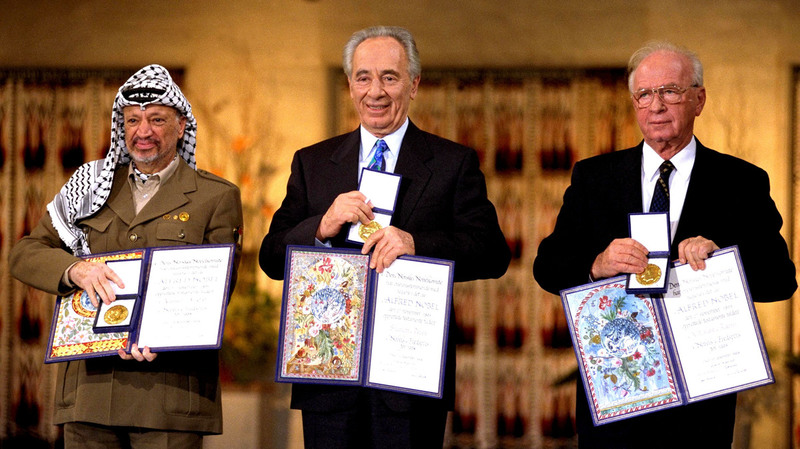 Israeli Prime Minister Yitzhak Rabin (right) was awarded the Nobel Peace Prize along with his foreign minister Shimon Peres (center) and Palestinian leader Yasser Arafat in 1994. Rabin signed an agreement with the Palestinians that launched negotiations between the two sides, though they've never reached a peace deal. "Because I did not agree with Rabin back then, I think it's very important that the people here will see me," he said. He points to his knitted yarmulke, or skullcap. This is a clue, he says, showing other Israelis that he is politically right-wing, religious and supports Jewish settlers in the West Bank, which the Palestinians claim for a future state. Busloads of religious youth came to this year's memorial. Many arrived from settlements in the West Bank. Danny Hirshberg, standing outside his home in a West Bank settlement, disagreed with Rabin's policies but helped organize this year's gathering in his memory. 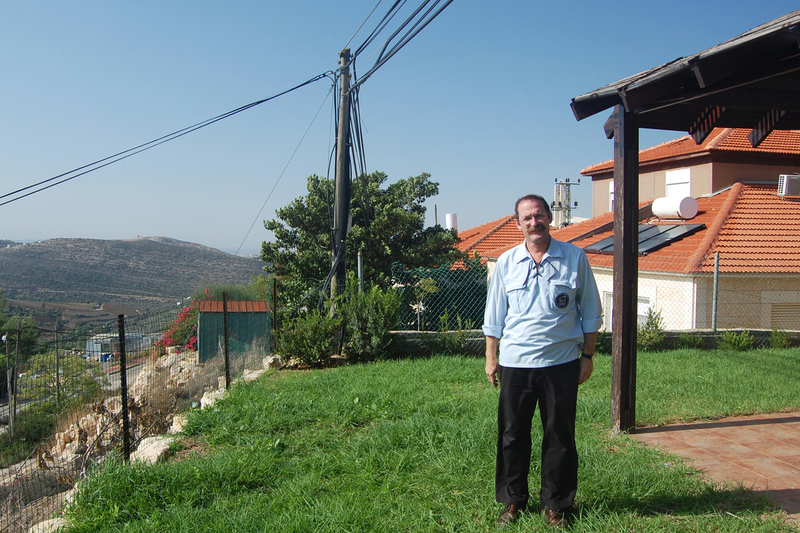 Danny Hirshberg, general secretary of Israel's biggest religious youth group movement, Bnei Akiva, drove in from his home in Talmon, a settlement of some 300 families surrounded by Palestinian villages in the northern West Bank, with views on a clear day to the Mediterranean. Rabin didn't think Israelis should settle the West Bank. "It was an ideological war between settlers and him," Hirshberg said. "He wanted to reach an agreement with the Palestinians, and we did not." Yet Hirshberg helped organize Rabin's memorial rally — with agreed-on ground rules: "We wanted the rally to stay away from controversial issues like peace or territory. We would go for what connects us — our commitment to democracy." Also organizing this year's rally was Barak Sella, a youth movement leader from a group called Hano'ar Ha'oved Ve'Halomed, at the other end of the political spectrum. Sella was 10 when Rabin was murdered. He's attended a memorial rally every year since. "For many, many years, it was basically a rally that belonged to one side of the political map," Sella said. "Mainly the left side. " 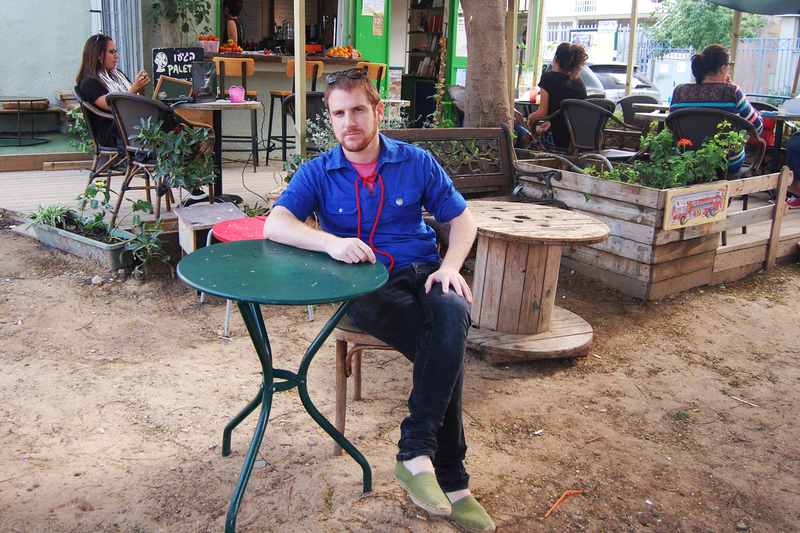 Israeli youth leader Barak Sella worked with Hirshberg to organize this year's Tel Aviv gathering in memory of Yitzhak Rabin. He was 10 when the prime minister was assassinated and has attended such gatherings every year since. That's his side. In part, this happened because much of Israel's left blamed the right wing for encouraging and supporting Yigal Amir, Rabin's unapologetic murderer. Eventually, Sella and groups that organized recent Rabin commemorations decided that inviting the "other" side could boost attendance and reset an expectation. "We wanted everyone to come," Sella said. "Everyone that is willing to agree that no matter what will be the conflicts between us, democracy will be the only way we'll solve our conflicts. Not violence. Not assassinations." One of the most passionately debated divides that has grown since Rabin's murder is whether Israel can remain both majority-Jewish and democratic. Sella says that would mean Israel cannot keep control over Palestinians, as it does in the West Bank now. But that suggests ending the occupation of the West Bank. And that circles right back to the issue that tore Israel apart under Yitzhak Rabin. In audio of this story, as in a previous Web version of this story, we misidentify Barak Sella as Barak Stella.